For those lucky Kodi users still owning an NYXBoard Hybrid, wake on USB is essential for a seamless HTPC experience. Below I’ll explain each step in getting that happening as well as some skin customisations to make things a little nicer down the road. For this tutorial I’m running an Intel NUC 54250WYK with OpenELEC. Unfortunately every BIOS is different. Some motherboards will support wake on USB, some won’t. Check your motherboards manual to find out more. 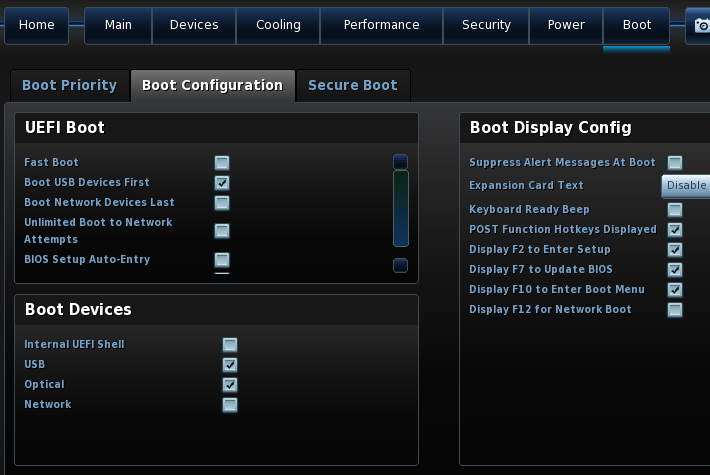 As for my NUC, I’m on BIOS version 0038 released on 2015-10-04. Go to Advanced – Boot – Boot Configuration and under Boot Devices make sure USB is checked. Hit F10 to save and exit. I have my NYXBoard’s USB dongle plugged into one of my NUCs front USB ports. I need to find out which USB port it is, and enable wakeup for that port. After all of the above is complete, I can now go to Power – Suspend (My NUC slowly pulses its blue suspend light) and use my NYXBoard’s power button to turn the NUC back on. Thanks to use teeedub for his helpful post on the kodi forums. Even with wake on USB working, it still only works when the NUC is suspended – not shut down. This needs to be fixed with a theme modification. With the copy in place, when you reboot Kodi it will automatically use the new version in place of the old due to Kodi’s theme directory hierarchy. No other changes are required for this to happen. Thanks to Gerhard Burger on AskUbuntu for his post on how to do this. Thanks to user eliaslear on the OpenELEC forums for his post detailing how to do this.